Virat Kohli, shall we pause? "The workload has started to disagree with me a little bit." The statement itself is disconcerting. 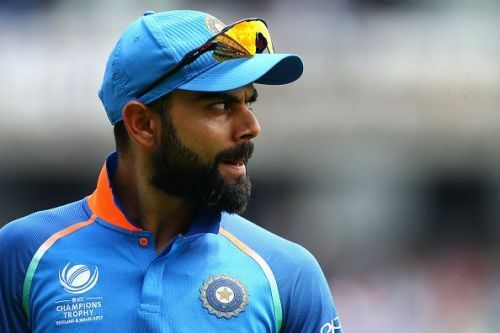 Virat Kohli's self-admission is the biggest indicator of the physical strain on him; he hates giving in, the maniacal stubbornness doesn't allow him to let go, ever. But Kohli's started to admit that it's all taking a toll. It is only going to increase as he clocks his 30th year on earth. Since the 2011 World Cup, Kohli has played more international matches than anyone in the world, a staggering 287 games across three formats. That's minus the IPL. For a man in his 20s, and a man of the caliber of Kohli, it isn't surprising that he is the leader of the list, but there are a few more underlying aspects than just his stunning batting form. The three-year window from 29 to 32 can be considered the peak for an accomplished batsman - by that logic, Kohli's best days should be ahead of him. At 29, however, the superfast express is slowing down, putting on emergency breaks to take halts out of nowhere. He is an absentee from the Asia Cup, and not many are happy about it. Sandeep Patil, the ex-selector, has questioned BCCI's judgment in making Kohli skip the all-important clash against Pakistan. He is slated to play the West Indies later this year. Why not skip that, he asks. Is Kohli burning out real fast? But a more valid question at this point is directed towards the man himself. He skipped the tri-nation Nidahas Trophy in March, admitting that he had a few niggles that had to be addressed. Yet, he was out in full spate, representing the Royal Challengers Bangalore over the next month and a half. The much-anticipated trip to Surrey was a whimper, ending before it started. Suddenly, there were reports of a slipped disc, but the Board was quick to hush it off as a stiff neck. The fissures first started to appear in South Africa, it seemed to be a minor 'back sprain' that kept him out of a T20 game, a harmless withdrawal at that point. It was a troublesome glute, and to not risk tearing a muscle, he opted out. He admitted it, months later, in England, when the back acted up again and sent him to the ground, requiring medical attention and all. His enthusiasm and drive, two of his biggest attributes, shouldn't come back to haunt him later. While tenacity can take a man places, there's only so much one's flesh and bones can stretch. AB de Villiers, Kohli's long-standing rival and teammate, had, in 2016, mentioned in his autobiography that he'll continue playing until he had no fuel left in his tank. Despite a Test sabbatical of over a year, he couldn't find enough fuel to stretch his cart till the World Cup, his biggest dream as a cricketer. At 33, he couldn't take it anymore and had to walk away. How long can Kohli, carrying the same, childishly maniacal enthusiasm, last? "If I train as hard as I train now, I will possibly play for 10 more years," he had declared in 2017. He hasn't had a particularly remarkable 2018, fitness-wise. Even when he is fit, one wonders if he's fatigue-free. The months after the 2019 World Cup will be critical for the team, likely to be without the presence of a certain Mahendra Singh Dhoni, albeit in the two formats he continues to play. There are tours scheduled to New Zealand, England, Australia and South Africa in the next three years. Kohli might have even more on his plate then. He's captaining three formats and an IPL team throughout the year, is the top batsman for his country (if not the world) and is advancing at breakneck speed. One only hopes that the BCCI sits down with him and chalks out a future, a symbiotic scheduling that helps both the cricketer and the country. It could mean dropping the skipper's band for his beloved T20 franchise or giving up a format's captaincy for India. He's too valuable to lose out to a fatigued body. No one wants a drained Kohli to lose steam at 34. He's conditioned his body remarkably, his fitness levels are incomparable with his Indian batting predecessors, but there will have to come a time when he eases his mangling grip. Small breaks have worked wonders for him in the past, he carved out a small break after the 2016 Australia tour and became a future legend with his career-defining form through the World T20, the IPL, and the home season. It's time he paused, took a long, deep breath, and traded fervor with deliberation as he visualizes his future. "I have to be very careful about how I go forward with my body, my mind, my cricket," he's admitted himself. The statement itself is disconcerting. Kohli has slaved away, it's time for a few siestas.